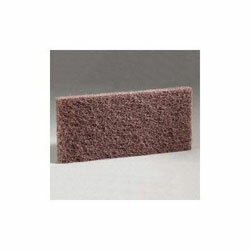 3M 8541 Doodlebug Brown Scrub N' Strip 4.5" x 10" cleansing pad designed for tough jobs like removing finish and wax buildup. Use with No.6473 Doodlebug Hand Block or No.6472 Doodlebug Pad Holder. Designed for tough jobs like removing finish and wax buildup from baseboards and floor edges. A great way to strip stairs.